After a LONG blog drought—while steadily working on a bunch of design projects, so hardly lazy—I accepted the fact that I wasn’t as diligent with postings as I wanted to be. I will post when I can commit to a more dedicated schedule or when I have something worth sharing. I happened upon a quiet moment today however, to reflect on what it is that gets me inspired. Some people swear by NEVER looking at design blogs, books or magazines. I suppose there is a certain kind of sponging that happens when your eyes & brain become the repository of all you’ve seen on Instagram, Facebook, Tumblr, or a combination thereof. Yet I do think it’s important to know designwise what is trending (both good and bad), as well as to confirm initial ideas had been already done. I sometimes use Pinterest to show clients that a particular style isn't original as once thought. I also find that jealousy can be a great motivator—from the whiny, “Awww, I wanted to do that!” to the empowering, “I AM going to create something as brilliant as that!” The key, though, isn’t in what you merely see, but in finding meaning in it…a sound concept or idea, not merely a style. Discerning clients are smart and rely on designers and creative directors to translate visual language into communications that are intelligent, tangible and relevant to their business or service models. So back to the question…what inspires me towards effective design solutions? There is the jumpstart from a robust briefing document with background history and project requirements, as well as from the research that follows. Both this jumpstart and other things I’ve been reading or thinking about at the time bring a wealth of visual ideas to mind. However, 2 key triggers of inspiration are CURIOSITY and CONNECTIONS. I’m always curious about everything around me and ask questions about why and how, or even “What if…?" Especially with new clients, I welcome the opportunity to learn new things and to understand their world better…whether something totally foreign to me, like saw blades or absinthe, or something VERY relatable, like handlettering or digital printing. Connections also exercise my mind, as I find meaningful threads or parallel themes in something. I’ll admit, this is a skill I developed from watching endless foreign language arthouse films (what the heck does that old lady with the recycling bin mean?) or Gordon Ramsay’s Kitchen Nightmares (seeing how flaws in a restaurant’s ownership or staffing connects to troubleshooting operation flaws or communication challenges). Even TV cooking competitions have taught me many important lessons: presentation, taking (good) risks, overdelivering to impress or to demonstrate potential, and what I call “Butter Chicken Poutine”: don't make what you think people expect. Make what you'd like yourself and know could work well memorably. Monotype has relaunched THE RECORDER Magazine, a type industry magazine that had been in circulation for around 70 years. I was enthused by the thickness, variety of subject matter and captivating visuals (designed by Luke Tonge) that explore ghost type, letterpress printing, identity design based on a massive dot matrix, book reviews, etc. After reading it cover to cover, I found that while graphically stunning in its archival nature, not all of its content is equally strong as the next. For example, a feature on Berlin’s first typographic concept store & gallery is supported by sparse imagery, underwhelming in comparison to the text. Nevertheless, the vast range of international coverage available to the editorial team brings great potential towards a surer footing in the next edition. Another magazine I’m quite enjoying is the aspirational THE GREAT DISCONTENT. Named after their popular website focusing on beginnings, creativity and risk, New York-based Ryan & Tina Essmaker initiated their print & digital publication through Kickstarter support with the refined design eye of Frank Chimero. Full of interviews with creative people from graphic designers to photographers, illustrators and a myriad of combinations thereof, reading this magazine is like having an intimate, honest conversation with likeminded folks who embrace and find joy in their current creative lives. It’s not about striving for career success in the "next big thing" as much as it is about keeping their souls full and alive with passion, authenticity and bravado in whatever they’ve done, and will continue with on their life’s journey. The 2nd issue was released early this year, with upcoming plans for a quarterly run. Each issue of the beautifully designed OFFSCREEN (published, edited & designed in Australia by Kai Brach, printed & shipped out of Germany) explores stories about the people behind bits and pixels….in print. Currently not available in digital format—and presumably never will, like Monocle Magazine—this limited edition publication celebrates the balance of digital life of designers, web & app developers, problem solvers and entrepreneurial types. Meant to be read offline in a distraction-free environment, this magazine is a proponent of The Slow Web, the idea that not all that is instant or fast is necessarily good for us. I think that in itself is pretty inspiring. Launched in early 2012, they’re now at issue #10 (the first 6 issues now out of print). LAGOM (a Swedish word meaning "just the right amount”) is co-founded by UK-based 8 Faces creator, Elliot Jay Stocks (who was responsible for the 8-issue run of one of the first independent typography magazines), and has a lifestyle focus on innovation and creativity. As with the rest of these indie publications, the photography style and narrative is visually engrossing and personal. It's a celebration of creative people, but not entirely what you may expect. Some are directly related to design agencies, while others are beekeepers working above creative offices. Who knew? Their 2nd issue was just released today in print and PDF format, with an iPad edition to come. FIVE SIMPLE STEPS also comes from the UK with a unique offering of individual or set-based mini faux-kraft books that are easily digestible (quick reads, not quick eats). Primarily focused on subjects related to web design, these little books went the reverse route with e-books designed to look like real books that were eventually adapted to print from digital…still with me here? They went through a little hiccup when original publishers, Mark & Emma Boulton, decided to pursue other interests, but thankfully new owners, Craig & Amie Lockwood, came in to save the day and resurrect this fine series. My best for last are two publications I can’t express my love for enough. The A BOOK APART series (13 books plus a couple 2nd edition updates), evolved from the brilliant web design-focused website, AListApart.com, with my highest recommends for "On Web Typography" by co-founder Jason Santa Maria and "Design is a Job" by Mike Monteiro. His latest book, “You’re My Favorite Client” I have not yet read since buying it, but will probably love if it’s anything like his first one, which I will probably re-read every year. 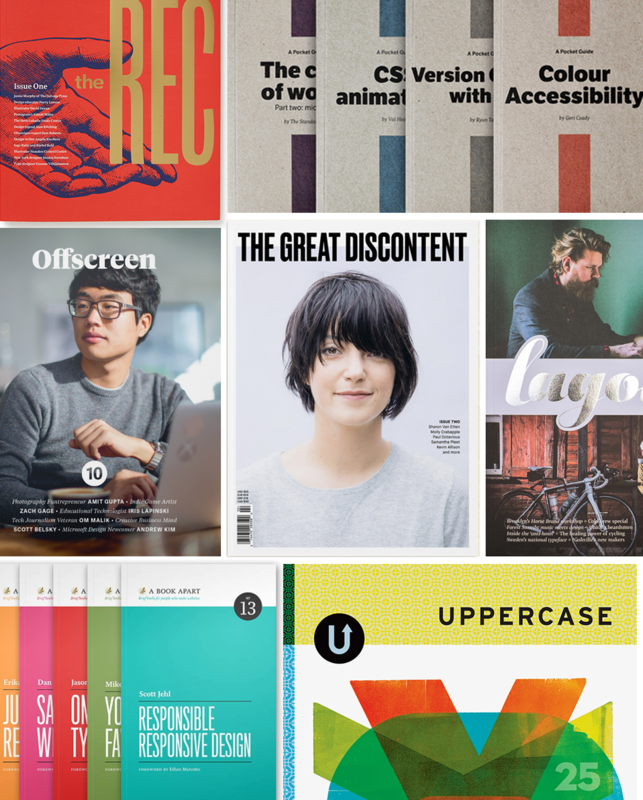 UPPERCASE from Calgary, Alberta is tastefully curated, compiled, designed, art directed and managed by a modest, yet uber-talented dynamo, Janine Vangool. Now with it’s 25th issue about to go to print, this highly collectible, colourful, textural and image-filled publication celebrates the craft of creativity…from weavers, calligraphers, printmakers, painters, designers, typographers, textile designers, and everything else in between. As active with her magazine as she is on social media and with regular e-newsletters, Janine is a reflection of everything that is right with independent publishers and creative people. Hard work, dedication, many long and late hours, financially taxing at times, but beyond a labor of love, it’s what they are compelled to do...for themselves first. And I guess that's the simple thing that inspires me in my design practice. It’s what I’m good at, what I’m regularly hired for, what I’ve always done and will hopefully always want to do until I am physically unable to. I’m compelled to do this.